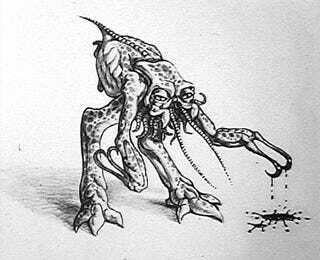 Here's screenwriter Dan O'Bannon's original concept art for the creature in Ridley Scott's Alien. Other Alien/Aliens concept art floating around online includes H.R. Giger's early face-hugger drawings and the heavy loader design that James Cameron rejected. Concept artist Ron Cobb's original alien design - he worked on the film before H.R. Giger came on board. The original alien's articulated jaw - note that the alien actually had a human skull in its forehead, which isn't really visible in the film. Another view of that weird skull-forehead thing. H.R. Giger's original facehugger concept art. H.R. Giger alien concept art! The Nostromo cockpit concept art by Ron Cobb, which became the actual blueprints. Early concept art for the ship with the alien eggs in it. Ridley Scott drew his own storyboards for the film. More Ridley Scott storyboard art. James Cameron's painting of the alien planet. James Cameron's alien queen concept art. Syd Mead's concept art for the heavy loader, which Cameron rejected.